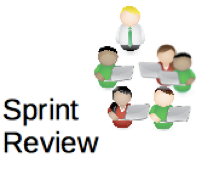 In this introductory-level article we look at the mechanics of a Sprint, and at how team members are expected to collaborate in order to produce a release-quality increment. Sprint Planning ought to be prepared for. The most important preparation is to ensure that the Product Backlog has been refined to an appropriate level of detail, with estimates and acceptance criteria (this is the purpose of Product Backlog Refinement). Next, the Product Owner should have ordered the work on the Product Backlog, and have a general idea of how to negotiate a valuable Sprint Goal with the team. The options for negotiating a Goal should also have been considered during Refinement, and reflected in backlog ordering. Also, the team should have an idea of their capacity for this Sprint, which is to say, how much work they believe they can take on. They may be able to use their experience with previous Sprints to help them ascertain the size of this budget. Each Sprint should result in a valuable increment of completed work, fit and ready for immediate release. 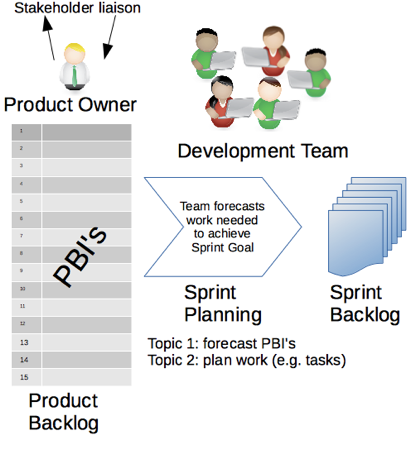 The Product Owner is wholly accountable for what “value” means, and ought to have ordered the Product Backlog in such a way that value can be maximized by the team, sprint-by-sprint. The first thing the team must do is therefore to plan which items from the Product Backlog should be worked on in this Sprint, so that the best value can be delivered by the end of it. To do this, the team work with the Product Owner to select the most valuable items from the Product Backlog which fits their projected capacity for the Sprint. Bear in mind that each item on the Product Backlog ought to have been given an estimate by the team, so they will know roughly how much work is likely to be involved. This selection of work should be cohesive, and not just a grouping of unrelated and disparate items. Remember that a Sprint is a time-boxed opportunity to achieve something significant. For example, by the end of the Sprint a coherent feature may have been delivered, or a significant risk will have been mitigated. The Sprint Goal is a simple expression of this purpose, of the overarching significance of the work selected, and the coherence behind the selection. 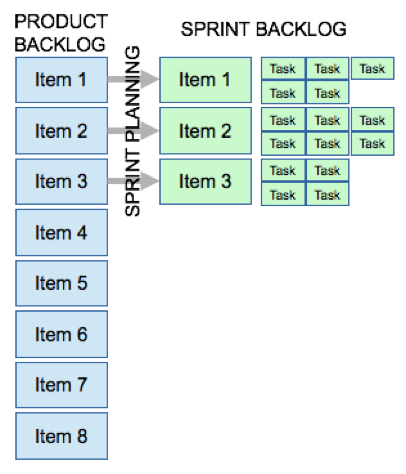 A Sprint Backlog is more than just a selection of work with an end goal in mind. It is also a plan for how that goal will be achieved, and how the associated work will be performed. This can be done by identifying and ordering the technical tasks that are likely to be involved. In effect the Sprint Backlog is a plan for meeting the Sprint Goal, and a forecast of the work that will have to be done. Once the team have planned their Sprint Backlog they can start work. If they have planned things out as tasks, they will collaborate with each other, as a team, to make sure that those tasks are completed. They’ll be able to track their progress by using their task board and their Sprint Burndown of work remaining. Every working day, at the same time, the Development Team will meet and plan what they will do to bring them closer to the Sprint Goal. 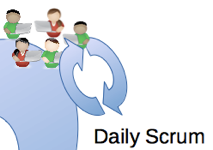 This meeting is called the Daily Scrum and it should never take more than 15 minutes. By the end of the Daily Scrum, the team should have a clear plan for the next 24 hours and an understanding of how they will need to collaborate in order to achieve it. They should also have a list of any impediments which require the Scrum Master’s attention. 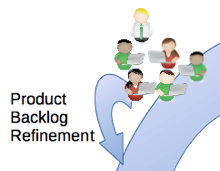 A refinement session typically begins with the Product Owner presenting the current Product Backlog to the team. 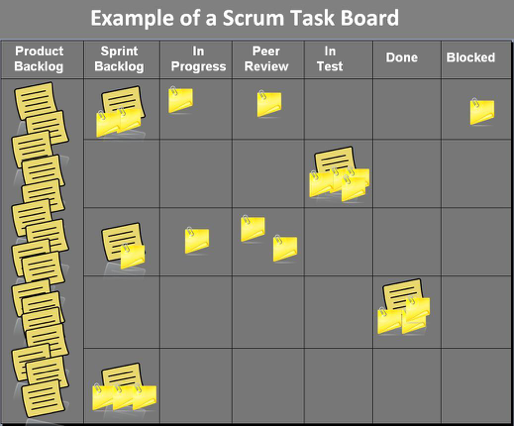 The backlog may be held in a number of forms, such as an electronic Scrum Board or other collaboration tool, or it may simply be a spreadsheet. A projector or shared screen can be very useful. The team start at the top of the Product Backlog and work their way downwards, refining each item in turn. They’ll examine each one and discuss its scope, and the acceptance criteria that will be necessary for its completion. Each item will then be estimated using a technique such as Planning Poker. A large item may be broken down into smaller ones which capture greater detail. Epics may be decomposed into user stories, for example. The team stop once the session’s time-box runs out. They will recommence where they left off the next time, eventually starting at the top again so the backlog is kept up to date. This means that each Development Team member must collaborate with his or her peers throughout the day, as they are jointly responsible for the progress of work. Any problems or failures are jointly owned by the team, as well as their successes. Collaboration is not something which is restricted to events such as the Daily Scrum, but applies to everything the team does throughout each entire Sprint. If a team has collaborated efficiently, they’ll have worked together to meet the Sprint Goal, managing any risks and adjusting their plans as necessary. They’ll have demonstrated control throughout the Sprint through an even burndown of work remaining, where each member saw it as their personal responsibility to help complete work in progress. They’ll have a valuable increment to demonstrate to the Product Owner and any invited stakeholders. A Review is something a team should look forward to. 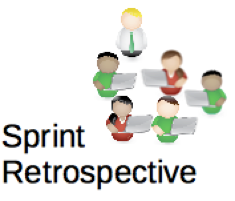 The next thing to do is to conduct a Sprint Retrospective. A Retrospective considers the process which the team is following. Are they working as effectively as they can? It’s generally best to hold the Retrospective immediately after the Review, because the former can introduce ideas for consideration in the latter. 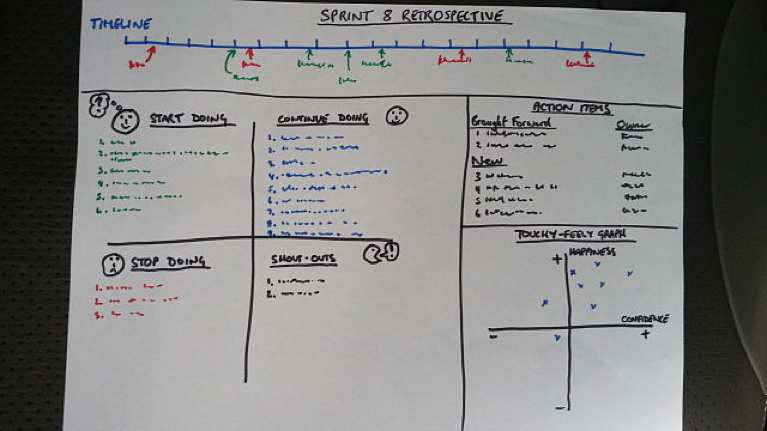 Establishing a time-line can help jog attendees’ memories about significant events during the Sprint.